A year of snot-oozing, carcass-scavenging, slime eels: Hagfish Science in 2017. Photo courtesy Oregon State Police. 2017 was a big year for hagfish science. Heincke’s law is one of those ecologic principles that more often acts as a foil for rejecting the null hypothesis than as a consistent pattern in ecology. It’s most basic summary is: The further from shore and the deeper dwelling a fish is, the bigger it grows. Heincke’s law does not appear to be true for hagfish, whose size appear to have no relation to the depth at which they occur. On the other hand, phylogenetic relationships do seem to play some role in regulating body size in hagfish. Schumacher and friends (2017) No support for Heincke’s law in hagfish (Myxinidae): lack of an association between body size and the depth of species occurrence. DOI: 10.1111/jfb.13361. Hagfish are master escape artists, capable of squeezing in and out of tight spaces barely half the width of their body. This great for getting in an out of rotting whale carcasses on the sea floor, creeping into crevices, and avoiding predators. But how do they accomplish this incredible feat? Hagfish have a flaccid sinus under their skin which allows them to control the distribution of venous blood and alter their body width as they wriggle through narrow passages. Freedman and Fudge identified 9 distinct behaviors which take advantage of this adaptation, including anchoring, forming tight loops to push the body through an opening, and bending the hagfish head 90 degrees to force it through a slit. And there are videos! Freedman and Fudge (2017) Hagfish Houdinis: biomechanics and behavior of squeezing through small openings. DOI: 10.1242/jeb.151233. The Fudge lab has been busy this year, cranking out some of the most noteworthy work on the incredible behavior of hagfish. In addition to examining hagfish motility, Boggett and friends looked into how those flaccid sinuses aid predator avoidance. The team build wee little guillotines loaded with shark teeth to see how hagfish skin protects the animal from vicious bites. In a year when a truckload of hagfish spectacularly crushed a car, the fact that this research was the biggest breakout sensation in hagfish pop culture says everything you need to know about the compelling results of this study. You can read more about this study at The Verge, Futurity, Popular Science, and plenty of other outlets. Boggett and friends (2017) Flaccid skin protects hagfishes from shark bites. DOI: 10.1098/rsif.2017.0765. The CDC was given a list of seven banned words for their upcoming budgets. Among the censored words are “science-based” and “evidence-based”, which, of course, are concepts central to the CDC’s mission. I have some thoughts about why this list has appeared at this time. If you think the CDC shouldn’t be censored in their mission to safeguard public health, call your representatives. Bird and Moon author Rosemary Mosco is this week’s Hagfish Lover of note: Feeling Sick and Snotty? Underwater robots reveal the all-you-can-eat-buffet of the deep sea. Hakai Magazine want to hear from you! Dear Hakai Magazine Reader, Who Are You? Everything Tangier is utterly fascinating right now: Angry messages to the Trump-supporting mayor of Tangier Island illustrate a need to listen, not to shout. I’m still just dumbfounded by this: Did a Glowing Sea Creature Help Push the U.S. Into the Vietnam War? In other words, Ocean Literacy could save us all from annihilation. I really hope you’re not sick of hagfish yet. Because Hagfish! Best headline, ever: Sea Spiders Pump Blood With Their Guts, Not Their Hearts. 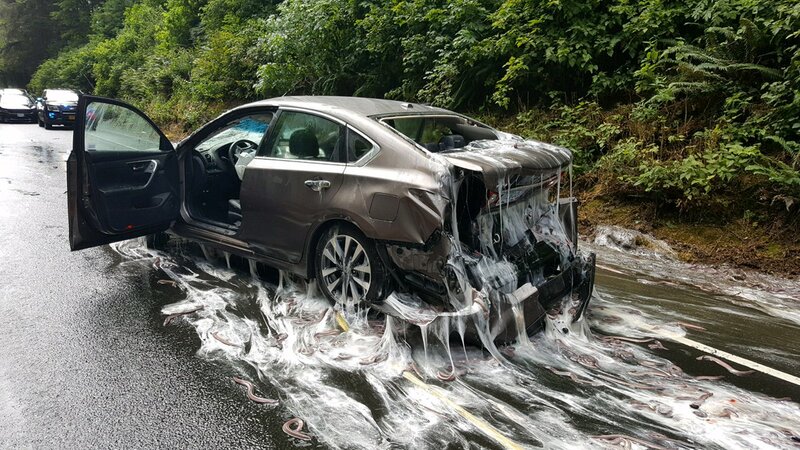 Earlier today, Oregon State Police reported that a truck carrying a shipment of live hagfish overturned, spilling its slimy cargo all over the highway and damaging at least one vehicle. Hagfish are eel-like jawless fishes. They are primitive, lacking a vertebral column. They are deep-sea scavengers notorious for tying themselves into knots as they rip chunks of meat from carcasses. Your ancestors, at some point, probably looked a lot like a hagfish. 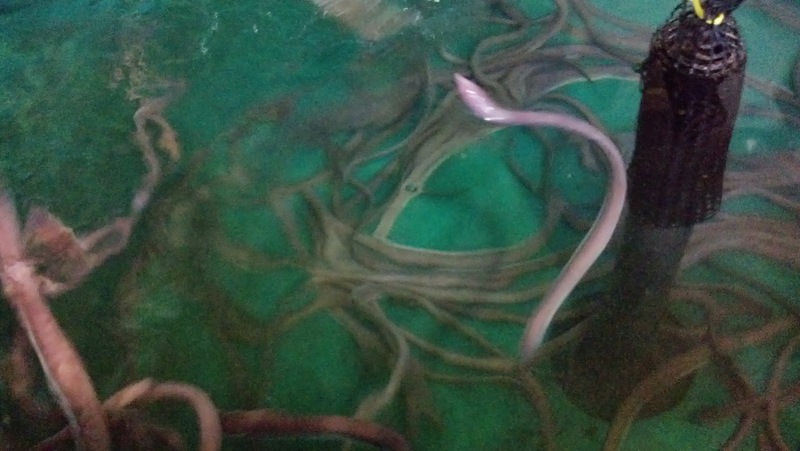 Hagfish at Mount Desert Island Biological Lab. Photo by author. I thought they were eels? 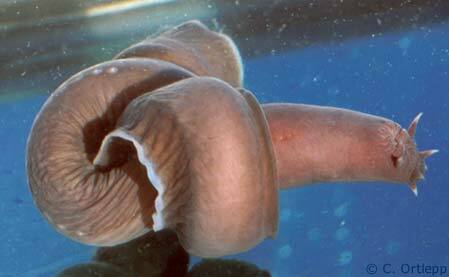 Slime eel (as well as snot snake) is the common name for Pacific hagfish. Dr. Milton Love has the simplest guide to telling the difference between hagfish and eels: Look at the hand holding the fish. Is it completely covered in slime? Then it’s a hagfish. Hagfish are Cyclostomes. Hagfish systematics is kind of a mess right now, with competing hypotheses about where hagfish and their ancestors fit into the history of vertebrate evolution. Unless you’re a taxonomist, I wouldn’t worry to much about hagfish cladistics; it will likely change a time or two in your lifetime. Ok, so what’s the deal with all the slime? Evolution is the most creative force on the planet. Everywhere we look, we find species with novel and phenomenal adaptations that put their comic book brethren to shame. In no ecosystem is this more apparent than in the vast and unfathomable ocean. Marine species, especially those in the deep sea, have evolved to survive in a environment that is completely alien to us. Several months ago, I unveiled “Five organisms with real super powers that rival their comic book counterparts“, but that was just the beginning. Without further adieu, I give you 5 more marine organisms that put their superhero counterparts to shame (and one bonus critter). In the deep sea, eyes are not among the most useful sense organs. While many deep-sea species have extremely reduced eyes, some have abandoned these organs entirely. Rimicaris exoculata is a shrimp endemic to deep-sea hydrothermal vents in the mid-Atlantic that is completely eyeless. Its carapace is smooth, without even a hint of reduced, vestigial eyes. This, unfortunately, is a problem because Rimicaris exoculata is a farmer. The blind shrimp grows bacteria in its gill chamber, bacteria that can convert the chemical-rich hydrothermal vent fluid into food for the shrimp. 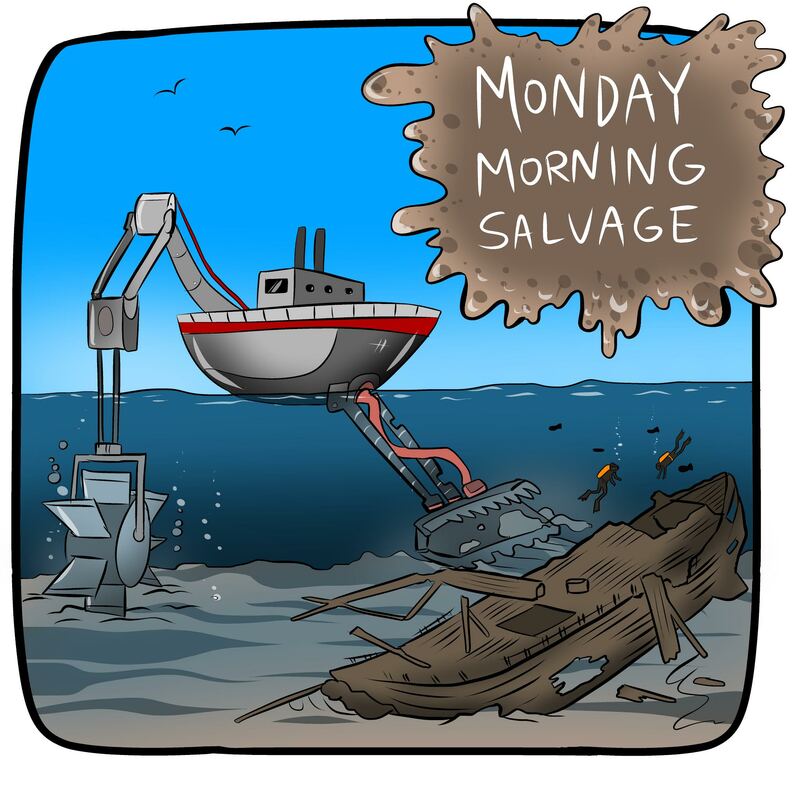 For lack of a more descriptive adjective, hydrothermal vents are hot. Some can exceed 400°C. Rimicaris exoculata needs to get close to this hot vent fluid to feed its crop of bacteria, but not so close as to become a hydrothermal hors d’oeuvre. And so, the blind shrimp evolved a completely new light-sensitive organ mounted on the top of its carapace–the rhodopsin-rich dorsal eyespot. The dorsal eyespot of Rimicaris exoculata doesn’t “see” in the normal sense, there is still almost no light in the deep sea. Rather, this shrimp is adapted to detect the black body radiation emitted by the hydrothermal vent. For Rimicaris exoculata, the deep sea glows with the light of super-heated hydrothermal fluid, allowing it to both find food for its bacterial crop and avoid getting cooked itself. It should be no surprise that Rimicaris exoculata is undoubtedly the favorite deep sea organism of another blind champion with super senses–Daredevil. Horseshoe Crabs, Coelacanths, Seven-gilled sharks, hagfish. Throughout the oceans there are creatures whose primitive bodies hearken back to earlier days in our evolutionary history. They possess basal characteristics that are more akin to those of the ancestors of our contemporary phyla. Because we can look into these organisms and learn something about our own deep past, we think of them not as modern descendants, but as living fossils, relics of a primeval state. This is, of course, a misnomer. Today is Hagfish Day! Who knew? Hagfish are primitive eel-like chordates make famous for their relative unattractiveness*, profuse production of slime, and charismatic ability to tie themselves in knots. They are perhaps the only ‘fish’ that possesses a skull, but no vertebral column. But the question “What is a hagfish?” goes much deeper than that and it’s answer is fundamental to the evolution of vertebrates and, ultimately, us.